After New Jersey was crushed by the Montreal Canadians 6-2 on Saturday night at the Bell Centre, the looming trade deadline cannot continue to be ignored. Even with the Devils going an impressive 8-3-2 in their last 13 games, they remain 12 points out of a playoff spot. At some point within the next week, New Jersey will need to make a decision on what their plan is for the rest of the season. We are already seeing teams like Toronto, and Arizona committing themselves as sellers. By doing that, it gives other teams more time prepare official offers for them. 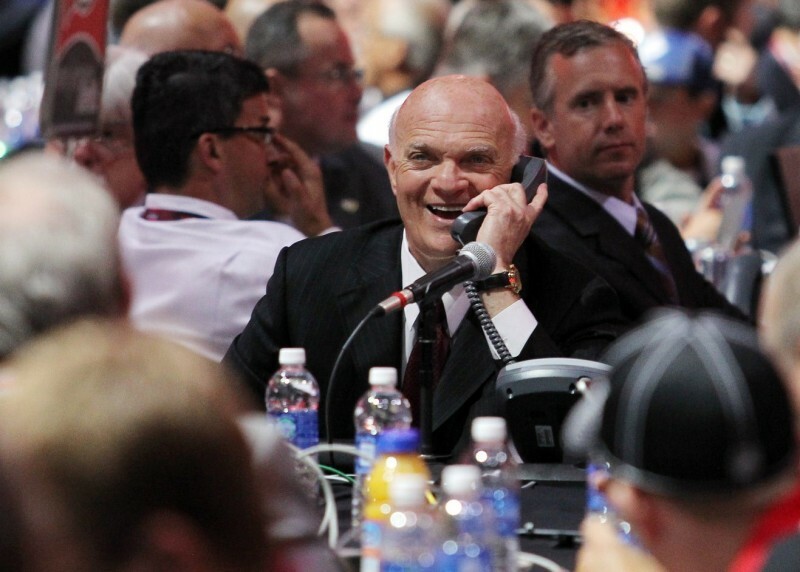 Whether or not GM Lou Lamoriello needs the time, he needs to assess every possible situation with a close eye before making moves. The first plan on his agenda should be identifying the pieces on his team, which can be moved. These players may not jump off the page, but they are players New Jersey needs to clear themselves of so other, younger players can take their place. So to help out a bit, here are my three New Jersey Devils who must be traded by the March 2nd deadline. It will be interesting how much Lamoriello could get back for either of them, but we have seen playoff-bound teams grab a bottom-end defensemen for insurance in the past. The main reason they should be dealt though is because Eric Gelinas needs to play. I’m not sure the coaching staff has against him, but plays like Fraser made against Montreal epitomize why Gelinas should be in the lineup over him. What makes everything stranger, is Gelinas has four goals and 11 points on the season while Harrold and Fraser have four points combined. If the Devils aren’t able to move Fraser, then definitely Harrold, even for a low pick. Gelinas’ skill-set allows him to do everything Harrold can, but better. Whatever the Devils decide to do, if either Fraser or Harrold can bring back any kind of asset, make the move. Firstly, Zubrus isn’t on my list specifically because of the high-stick he took against P.K. Subban, which quickly afterwards, Montreal scored two power play goals 59 seconds apart. Zubrus is on my list because no matter how popular he is in the locker room and among the fans, he’s just not producing. Zubrus has two goals, seven points, and is a minus 6 on the season. What makes him valuable though is his playoff-like style of play. The playoffs are all about grinding out your opponent, enforcing physical dominance, there’s a reason L.A. as won two Stanley Cups in three years. Zubrus is the kind of character guy that every playoff-bound team looks for when acquiring that extra piece at the deadline. The problem that may scare away teams is his cap situation. Zubrus is making $3.1 million this, and next season. If Zubrus was a UFA at the end of the season then it would be a different story. I like Zubrus a lot, he’s been a great Devils since he arrived, but there are times when you have to move on for the betterment of the team. It’s hard not to love the guy. We’ve watched him break records since he joined New Jersey at the start of last season. He’s great in the locker room, with the players, and the media. However, Jagr’s situation is very similar to that of Dainius Zubrus, except the value returning would be much greater. To make a quick analysis of what Jagr may be worth; in 2013, Jagr was traded from Dallas to the Boston Bruins in exchange for Lane MacDermid, Cody Payne, and a conditional second-round pick which became a first-round pick with Boston advancing to the Eastern Conference Finals and the Stanley Cup Finals. What makes trading Jagr so interesting is because of his age. Jagr will turn the rip-old age of 43 on February 15th, and would be a pure rental if he were to be traded. No doubt some of the teams that would be interested would be the likes of Anaheim, Detroit, Montreal, Pittsburgh, maybe even Nashville if GM David Poile decides to go all-in. One thing we do know is Lou will trade Jagr to a place where he has the best opportunity to win a Stanley Cup. Jagr’s owed at least that much for dedication he’s showed towards the Devils organization over the past two season. 12 points is a lot of ground to cover, and 30 games isn’t a lot of time to do it in. It may not be in Lamoriello’s DNA to sell off at the deadline, but with Connor McDavid possibly at the end of the tunnel, he may just have to push his DNA aside for a month or two. Who do you think New Jersey should trade?